While I am not the “camp out in front of the movie theater a week early to get tickets” kind of Star Wars fan, I would be lying if I said I didn’t let out a little scream of excitement when I learned that the original cast of Star Wars would reunite for the new film. Star Wars, The Empire Strikes Back and Return of the Jedi are all pure cinematic gold. They perfectly embody what a great family film should be—action, humor, a little romance and the epic battle between good and evil all rolled together into one great trilogy. So just the thought of seeing the characters of Han Solo, Princess Leia and Luke Skywalker again made me smile. I have to admit that I am NOT a fan of the second three films in the franchise. After slogging through The Phantom Menace with its terrible dialogue, overuse of CGI and boring and confusing plots, I didn’t even bother to watch the remaining prequels. It was just too painful. I also am blissfully unaware of the Clone Wars or Star Wars Rebels TV shows. I am old school and am only interested in the Skywalker family drama. Arriving at the theater early to get good seats, I got a kick out of the frenzy surrounding this film. I can’t remember the last time I saw such long lines to get into a movie. When the opening credits began rolling up the screen and John Williams’ brilliant theme song started, I actually got goosebumps. The audience was teeming with nostalgia-filled giddiness. Thankfully, director J.J. Abrams did not disappoint. He did a masterful job of weaving together classic elements of the first three films with a brand new hero and a terrific adventure. The Force Awakens introduces us to Rey, played by newcomer Daisy Ridley. I don’t know where the casting agents found her, but she is fantastic and absolutely holds her own against the veterans in the cast. She brilliantly portrays Rey as a strong and capable warrior who is also sensitive and caring. I love the fact that there is a female lead in this movie as a role model for our kids to look up to. Rey finds BB-8, a lovable droid similar to R2-D2 (although you eventually do get to see R2 along with companion C-3P0) who carries important information on the location of Luke Skywalker needed by the resistance. While trying to get BB-8 to its rightful owner, Rey meets Finn (John Boyega), a former Stormtrooper who has left the dark side. The two quickly become targets of the evil First Order who are also searching for clues to locate the missing Luke Skywalker. When Han Solo (the always dreamy Harrison Ford) shows up with Chewbacca, it’s a perfect blend of old and new as he jumps right back into playing the charming space smuggler who stole our hearts over 30 years ago. I wish that kids could understand just how crazy it is for their parents to revisit this world and these characters who have made such a lasting impression on us. If I had to be completely honest, there are a few times when scenes are a bit too similar to the earlier films and therefore somewhat predictable. There is a fine line between honoring the original stories and being too repetitive. But if that line was crossed at some points, it was also very well managed at other times, giving the audience a good laugh or smile remembering the old times. I won’t spill any more details on the story as it’s best to experience it for yourself. I really am thrilled that J.J. Abrams has recreated the magic of the original trilogy, and I can’t wait to share this newest chapter with my family. 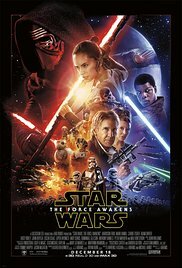 This movie does have a PG-13 rating as there is violence from blasters and lightsabers and some blood is shed so keep that in mind when you are deciding what is appropriate for your kids. Happy Holidays and May The Force Be With You!